Today we learned just how deep the benefits freeze will be in its fourth and final year. In July 2015, having promised £12 billion of welfare cuts – reportedly on the assumption that the Liberal Democrats would argue this down – George Osborne announced exactly that. Chief among these cuts was a further working age benefits freeze. So no matter what the rate of inflation was, benefits would not be increased in April 2016, 2017, 2018 or 2019. How important this nominal freeze would prove to be couldn’t be known exactly in advance – only predicted – as its real impact depends on inflation. In 2015, it was thought that inflation would be below 2 per cent in every year, as the table below shows. At first, this forecast actually proved too high, with very small price rises in 2015 and 2016. 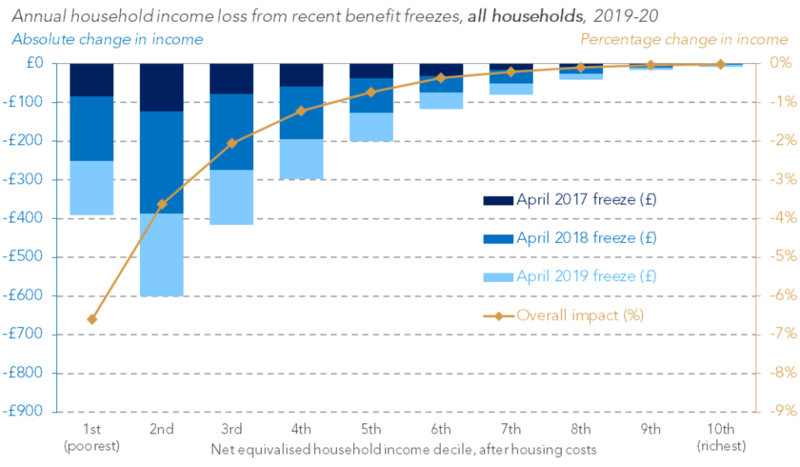 This meant that the benefits freeze had only a limited impact in its first two years. But with the Brexit vote and resultant price increases, CPI inflation reached 3 per cent in September 2017. Normally, that September figure would have been used to uprate working-age benefits for the next tax year but, due to the freeze, that didn’t happen. And now we know inflation for September 2018 was 2.4 per cent, but working-age families will be denied that inflationary benefits increase next April. Overall, the real cut to many benefits from the four-year freeze is over 6 per cent (and that’s before considering separate or earlier cuts). That cut of over 6 per cent has applied to Child Benefit, Universal Credit, (non-disability) Tax Credits, Housing Benefit limits, Jobseeker’s Allowance, Income Support (largely for lone parents and carers), and Employment and Support Allowance for the ill or disabled (except the support group component). 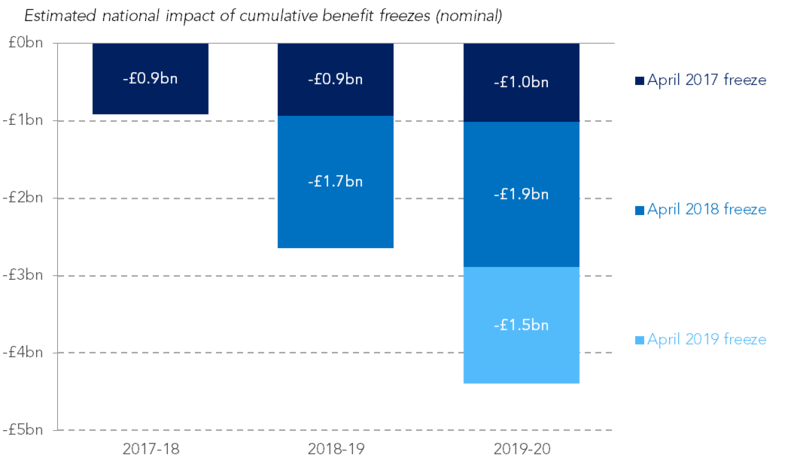 The freeze as a whole now looks set to save the government around £4.4 billion a year – considerably more than the £3.9 billion originally forecast. And a large part of the saving – a £1.5 billion cut – will effectively begin in April 2019. So much for ‘the end of austerity’. This four-year freeze has come on top of earlier cuts. Most working-age benefit increases were limited to 1 per cent in 2014-15 and 2015-16, and limited or zero in 2013-14; some key benefits were frozen in 2011-12 and 2012-13; and the default for uprating was downgraded from RPI-uprating to CPI-uprating in 2011. 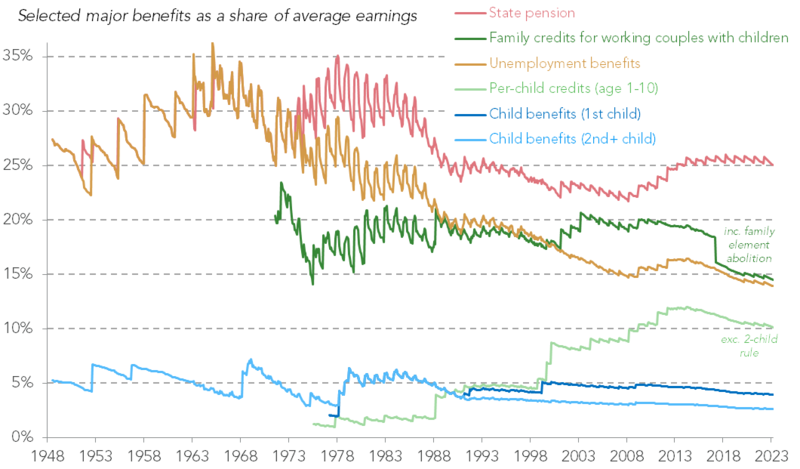 All in all, Child Benefit is now already worth less than it was in April 1999 (after Labour boosted it). 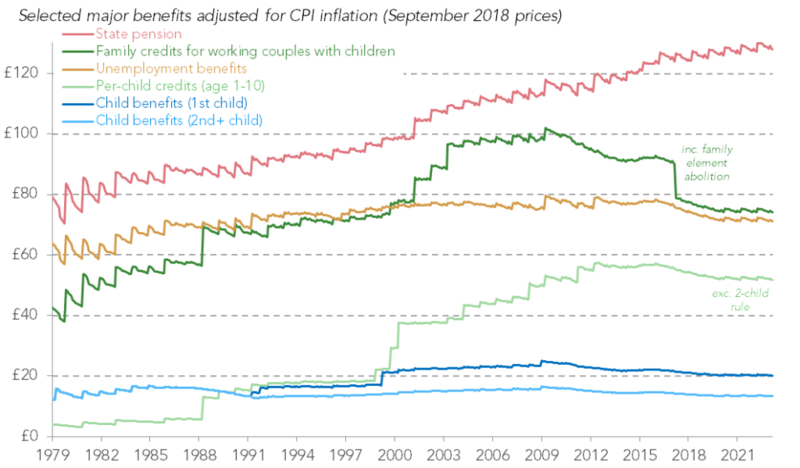 Indeed, beyond a family’s first child, Child Benefit in April 2019 will be worth 14 per cent less than when it was (fully) introduced in April 1979 – despite huge increases in societal wealth since then. Jobseeker’s Allowance – which might (if we ignore sanctions) be considered to be the UK’s living standards floor – will be lower in April 2019 than it was in April 1991. And if we were to compare these values to earnings or GDP per capita, the degree to which the poorest have been left behind relative to everyone else would be even more shocking. As a result, it should hardly be surprising that relative child poverty has risen for five years in a row up to 2016-17 (the latest data), even before the higher inflation and deeper cuts of 2017-18 and 2018-19. Focusing again on the four-year freeze, Figure 4 shows the policy’s distributional impact. This is split into what has been implemented already and what will effectively happen in April 2019. If we exclude pensioners and working-age non-parents, the impacts become even clearer. 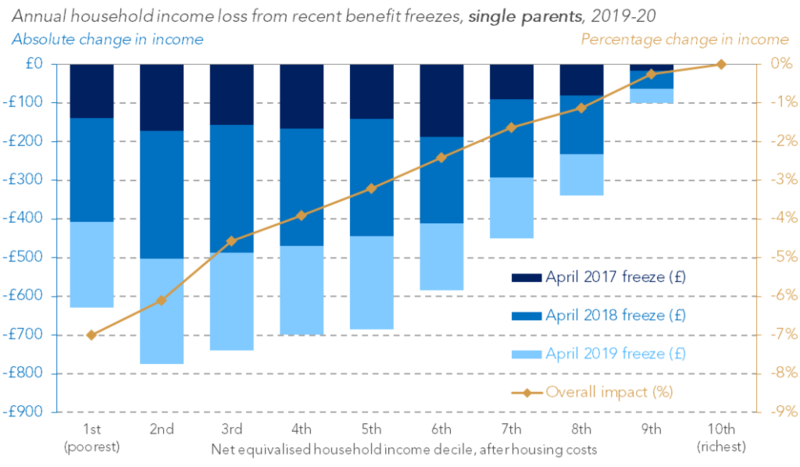 The average couple with kids in the bottom half of the income distribution will be £580 poorer in 2019-20 than if inflationary uprating had occurred since 2016-17, and the average poorer single parent will be £710 worse off. 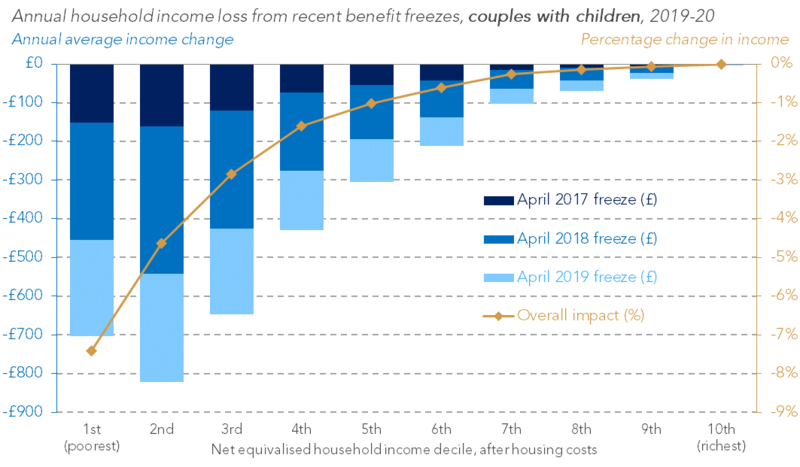 The April 2019 freeze alone will mean a £200 hit for an average poorer couple with kids and a £250 hit for poorer single parents. Of course, it’s not too late for the government to cancel the April 2019 freeze. But the Budget is probably its last chance to avert these impacts. Whether or not the final freeze goes ahead, there is also a tough question for the opposition parties. Labour, the SNP and the Liberal Democrats have all said they would end the freeze. But CPI uprating is already set to return from April 2020. The big question now is whether those parties would actually undo the real term cuts that have already happened (i.e. though a real terms increase) if they got the chance, or if that £4.4 billion, 6 per cent cut will simply be accepted as a fait accompli. The talk of the town may be of ‘the end of austerity’ and ‘Brexit dividends’, but for low to middle income working-age families – particularly parents – the outlook is quite different. On top of weak pay growth, their outlook includes a further benefits freeze, the transition to Universal Credit with its slashed work allowances, the phasing out of the valuable ‘family element’ and the phasing in of a two-child limit. Ending the freeze one year early, with benefits rising just after Brexit day, would help turn that outlook around. Note: This post was first published on October 13, and has been updated on October 16 using new inflation figures.